In 1993, the Board of Supervisors reorganized the County management structure by consolidating various departments into agencies. This resulted in the Department of Public Works (roads), and the Water Resources Department (water and wastewater) being combined into a single entity called the Public Works Agency (PWA). The head of the old Water Resources Department was appointed as PWA Director. As part of the 1999-2000 Grand Jury review of PWA, the organization and management of PWA was examined to see how well it was functioning and to determine if changes are needed to make it more effective. The PWA organization chart is shown above. The PWA Director reports directly to the Board of Supervisors and is responsible for all activities of the PWA. 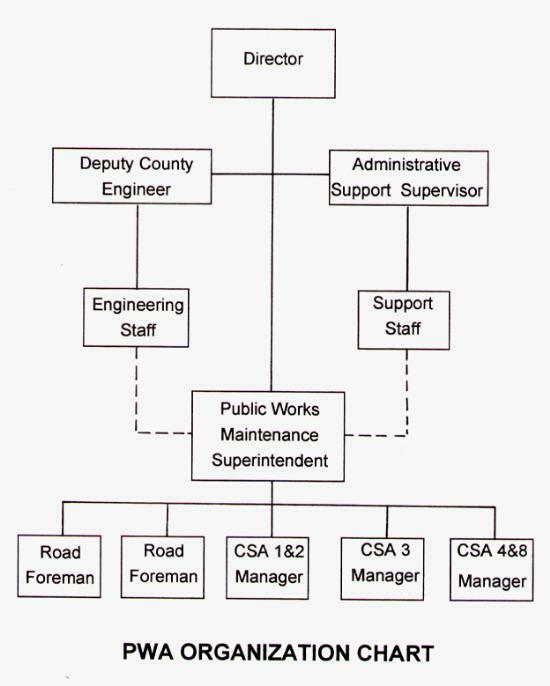 As defined in the job description, the Deputy County Engineer has both line and staff functions, although the organization chart shows this as a staff position only. There are two road crews whose responsibility it is to maintain the 410 miles of County roads. Each crew is supervised by a Public Works Maintenance Supervisor ( hereafter called "foreman"). The two foremen report to the Public Works Maintenance Superintendent. The Public Works Maintenance Superintendent is one of the most influential positions in the PWA. That person supervises the road crew foremen and the County Service Area (CSA) managers and is responsible for all field operations. Responsibilities also include liaison between the PWA management and the operations and maintenance staffs of both the road crews and the CSAs. The current Public Works Maintenance Superintendent has little training or experience in water and wastewater operations. Management personnel, above the level of the Public Works Maintenance Superintendent, have little contact with road crew foremen and CSA managers. The PWA does not have an effective management information system. The PWA does not have a policy and procedures manual. Financial accounting for the road crews is performed by the PWA support staff. Accounting for the CSAs is performed by the County Auditor. Approximately $ 510,000 is budgeted this year for major road building materials such as asphalt, rock, paving oil, and road building fabric. Purchasing procedures for the PWA are governed by County Policy 5-100 which requires that purchase requisitions be prepared, bids obtained, and blanket purchase orders issued by the GSA for such materials as listed under "12" above. The GSA has no current blanket purchase orders issued for road building materials. The PWA is currently evaluating the feasibility of developing a Geographical Information System (GIS) as an operating and planning tool. The County Assessor is exploring a similar system. Management and operational responsibilities are neither well defined nor understood by many PWA employees. This is particularly true of the position of Deputy County Engineer. The organization chart implies that position is responsible only for the engineering staff of the PWA, but the job description gives it a much broader supervisory authority. The organization chart, the job descriptions and the PWA Director's description of responsibilities are in conflict with one another, which further leads to confusion over lines of responsibility, authority and communications. The Public Works Maintenance Superintendent position is a mid-management position that serves at the will of the Board of Supervisors. The person in that position should be expected to be accountable for carrying out Board policies and responsible for ensuring that all subordinate staff are properly supervised, trained and performing their duties in an efficient and professional manner. That person should also be well versed in both road operations and water resource operations, and should possess proven management skills. As detailed in other sections of the PWA Review, the Public Works Maintenance Superintendent does not possess the requisite qualifications to properly supervise the CSA managers. Having violated the County policy governing an alcohol-free workplace, the Public Works Maintenance Superintendent has not set a proper example for subordinates, nor has he provided the direction, guidance and supervision that should be expected of this position. The CSA managers are largely unsupervised. What direction they do receive comes from several sources; the PWA Director, the Deputy County Engineer, the Administrative Support Supervisor and the Public Works Maintenance Superintendent. Although the organization chart defines a chain of command, lines of communication are not well defined. This has led to confusion and frustration at all levels within the PWA. Monthly meetings between the PWA Director and the Board of Supervisor's Public Works Committee do not provide a proper forum to fully inform the Board of the PWA's activities. Management's goals and objectives have not been articulated and there is no clearly defined plan, either short- or long-range, toward which the PWA staff can work. As a consequence, normal operations are carried out in a reactive manner, rather than in a orderly, planned fashion. The PWA ignores the requirements of the County purchasing policy. About $510,000 is budgeted this year for major road building materials, yet these materials are purchased without following proper procedures or obtaining authorization. In addition, purchasing decisions seem to be made by relatively low level managers without necessary safeguards to ensure against possible abuse. Having PWA accounting duties carried out by two separate agencies (PWA and Auditor) appears to be unwieldy and could lead to loss of management control over some CSA operations. The PWA and the County Assessor are independently considering development of a GIS program. A well designed GIS can have great benefit to many County departments, but without a coordinated inter-department approach, its value will be greatly reduced. This subject is covered in more depth in the County Management Review. The PWA should be reorganized to strengthen management of its operations. There are several options available including: (a) breaking the agency into two separate entities, one for roads and the other for water and wastewater; (b) separating those two functions within the framework of a single agency by making the Deputy County Engineer responsible for water and wastewater operations; or (c) make the Deputy County Engineer a purely staff support position and have two supervisory positions, one managing roads and the other water resources. Another option is to have the Amador Water Agency take over all CSAs and reorganize PWA accordingly. Because reorganization is complex, however, it should be finalized only after considerable study and input from all levels of the agency and the Board of Supervisors. The Board of Supervisors should make it clear to the PWA Director that he is responsible for budgetary management, strategic planning, goal setting, advising the Board of Supervisors on policy issues, and general management of the agency. He should not be concerned with day-to day operations, as is presently occurring. All management and supervisory employees should be required to clearly understand their responsibilities and duties, and they should be entrusted to carry them out. Tasks should be delegated to the appropriate organizational level. If the present organizational structure is retained, the current Public Works Maintenance Superintendent should be reassigned to a position for which he is qualified by experience and training. The new Public Works Maintenance Superintendent should be a person with credible qualifications and proven abilities in both management and operations. Coincident with reorganization studies, the Board of Supervisors should evaluate the benefits of combining all PWA accounting functions into one group within the PWA. The Board of Supervisors should increase their level of monitoring over operations of the PWA. The PWA Director should design and implement a MIS to replace the informal system now in use. The MIS should provide reports to each management level to give managers and supervisors the information they need in a timely fashion. The MIS should contain provisions for reporting progress and status to the Board of Supervisors. Policy 5-100 (Purchasing) should be rewritten to clearly spell out purchasing procedures and to define safeguards to ensure against abuse. Purchasing of major recurring items, such as asphalt, should require that annual bids be obtained and a one-year blanket contract be executed with a single supplier. The Public Works Maintenance Superintendent and the CSA managers should be given delegated authority to purchase items up to prescribed value without prior authorization. For more costly items, approval by a higher authority should be required. The rewritten policy should establish checks and balances to ensure that its provisions can no longer be bypassed.